I was about to start this post by reporting that this book must be out of print. I actually found it for £3 on a secondhand bookstall in St Mary’s Market, Cambridge. However, I am very heartened to learn that it’s still very much out there, and available to purchase from World of Books and also obtainable to borrow from WorldCat.org. So who was Angela Brazil? Why is she important? Why is someone bothering to read and review a biography written in 1976? Especially when she is on holiday. Is it the rain pouring down from the Alps, or the parties of bored Austrian teenagers doing karaoke in the bar across the road, in German, to songs I’ve never heard before, and never want to hear again? To all of this, I can honestly answer No… apart from never wanting to hear karaoke in German again. Angela Brazil wrote school stories for girls, beginning at the turn of the 20th century and was still writing at the time of her death in 1947. As a pre-teen, I lived and breathed school stories: Mallory Towers, St Clare’s, The Naughtiest Girl in the School, the Chalet School series (all 60 of them!) and many, many more. My mother recommended the Chalet School, and Angela Brazil, but, whereas I was readily able to obtain copies of the former from the local library, I never really embraced Angela. I do remember bundles of hardback Angela Brazil books with their faded red and yellow covers, at the bottom of my mother’s wardrobe, below the folds of her flowing New Look dresses, but – children are funny things – I was put off by their general dusty smell and ‘old’ feel. I think I read one; it was about a girl called Nesta, who was adopted by her mother’s rich, childless friend, then returned to her real mother (‘Nesta’s New School’, which is still available on Amazon). It is clear that her biographer, Gillian Freeman, didn’t like her subject very much, although her analysis of Angela’s work, and of the times in which she lived, is thorough and insightful. She quotes frequently and knowledgably from a wide range of Angela’s books, although sometimes her text is confusing to follow, because the layout on the page makes it difficult for the reader to work out whether he/she is reading a quote from one of Angela’s books or Gillian’s commentary. Also, she doesn’t cross reference fictional characters and real life personages enough; one is left wondering sometimes who exactly is the ‘Mildred’ or ‘Dotty’ about whom she is making such a strong point. From a social history point of view, this biography is a valuable resource on life in England in the first part of the twentieth century, how people lived, their emotions, standards and attitudes. What Gillian only touched upon was the fact that education for girls was only just beginning at the time Angela was writing; it was both ground-breaking and a novelty for young girls to be together, away from home and able to get up to ‘jolly japes’ like their brothers. Her next point, however, was well-made, that Angela’s world view was otherwise old fashioned, even at the time she was writing it, that Picasso, the Bloomsbury Group, fascism and communism had all wafted over her. Gillian also discussed in detail the physicality between the girls and their teachers, and their extravagant language, how they frequently referred to being ‘in love’ with a friend. Moreover, one of Angela’s heroines was named ‘Lesbia’. But Gillian knows and understands her subject, and the age in which she lived, well enough to recognise innocence and naivety. Women in the nineteenth century (the era where Angela belonged) did have very intense friendships and used very emotional words. Well, dear Reader, are you still with me? Sorry this post is so long. Do I recommend this book – yes. Did I enjoy it, on a personal level – yes. More than that, though, I believe that Angela Brazil is very important in literature and in women’s literature in particular, because she wrote the first proper school stories for girls. Everything that came after – your Enid Blyton and your Chalet School, possibly even Harry Potter – developed the theme that Angela began, even if we haven’t read her output. Please bear with me a bit longer, if you can. One of the reasons I’m now in Austria, in the Tyrol, close to Innsbruck, is because of Elinor Brent-Dyer’s Chalet School, which started off here. I can confirm that the area is every bit as beautiful as Elinor said it was and, after a bit of Googling, I discovered that Elinor has a memorial in Pachenau, which is close to here, and also that there is an organisation called ‘Friends of the Chalet School‘. They don’t make school stories like they used to. 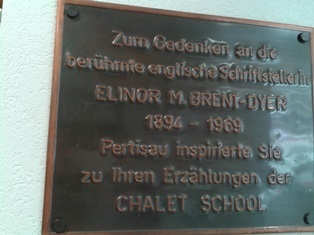 Plaque to Elinor Brent-Dyer in Library in Information Centre at Pachenau, Austria. It is very interesting, if you like school stories. You could borrow it electronically from World Cat. Btw, I was looking through your blog last night. Really interesting, really enjoyed it. It’s always interesting to read about how real people live in different countries. Thank you! True… a couple of hours in a plane and you end up in a whole new world! Have lived in three very, very different cultures- India, UK and now Qatar…. They can’t get any more “varied” i guess!